New York is nicknamed as the Empire State. It ranks as the 3rd most populated state in the US. In 2012, New York has a population of 19,570,261 according to the United States Census Bureau. New York City – where most of the population is concentrated – has over 8 million residents in that year. The state’s obese numbers less than 28% of the population. Almost 22% of New York City’s residents are obese. In 2010, an estimated 320 out of 1000 senior citizens in New York have Alzheimer’s disease. As a result, the state has the fourth highest incidence of Alzheimer’s for this age group in the country. An estimated 13.7% of New York’s population composes of senior citizens in 2011. Long term care insurance policies will cover health and social services for them. There are also policies that offer specialized care for seniors with Alzheimer’s disease or dementia. The prevalence of Alzheimer’s disease and other intellectual complications among New York’s seniors necessitates long term care in the state. Long term care is also required by aged citizens who need everyday assistance with even basic tasks such as eating and dressing. It is important to know the costs of various long term care services and facilities in the state. The table below, based from Genworth Financial’s 2010 Cost of Care survey, shows the average annual costs of long term care among regions in New York. New York is one of the states with the most expensive long term care services in the US. Citizens with low incomes prefer to apply with Medicaid. However, if they exceed the asset ownership limit – even slightly – they may spend up their resources and face poverty. Good thing that New York is one of the states that initiated a partnership for long term care. This program involves cooperation between the state government and private insurance companies. New York’s residents can get long term care benefits even if they are above Medicaid’s limit. They can also secure an amount of their assets that is the same as the payments they get from their policies. Issue Date: The policy must be issued after the effective date of the Partnership Program in the state (January 1, 2006). State of Residence: The policy holder must be a resident in New York at the time the coverage became effective. Qualified under Federal Tax Law: All Partnership policies must adhere to the definition of a Long Term Care Insurance policy in section 7702B(b) of the Internal Revenue Code of 1986. The New York Department of Financial Services provides private insurance companies the license to sell Partnership policies. Only agents who have received Partnership Program training are allowed to offer, sell and negotiate Partnership policies. 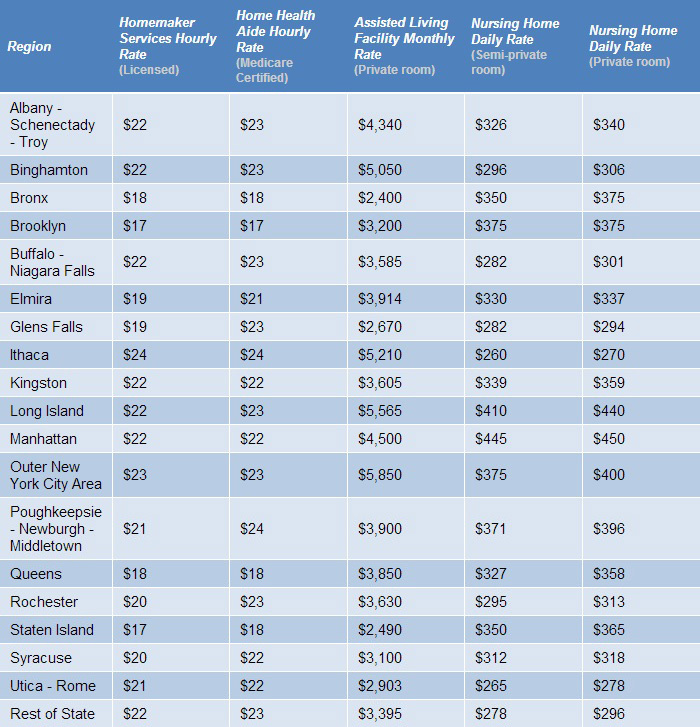 Estimated Average New York State Nursing Home Rates. 2007. New York State Department of Health. (Webpage revised January 2009). Home Care Association of New York State 2008 Annual Conference. Consumer Guide to Community-Based Long Term Care. 2007. New York State Department of Health.